This is the Final Edition of the USF-I Base Transition Smartbook. Updated from the October 2010 edition, it provides a single-source, quick reference guide for the base transition process, and captures/de-conflicts updated and additional base transition guidance through the use of bold and strike-through text. The information in this Smartbook summarizes base transition Standard Operating Procedures (SOP), published US Forces-Iraq (USF-I) orders/ guidance, and lessons learned from past base transitions to facilitate honorable and successful transitions of remaining non-enduring bases and enduring sites. 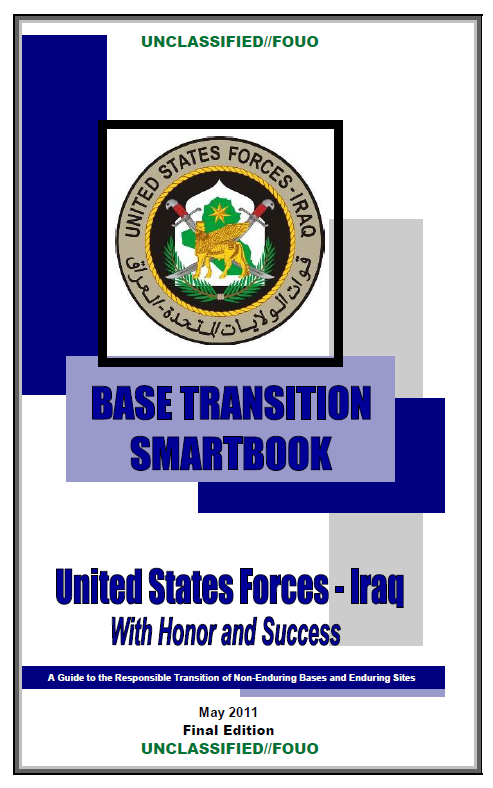 The USF-I Base Transition Smartbook is the guiding document for transitioning USF-I bases in the Iraq Joint Operations Area (IJOA) to the Government of Iraq (GoI). Guidance is intended to be flexible enough to fit a range of situations, and to ensure a base is transferred properly, in accordance with applicable laws and regulations. The Base Transition Smartbook is located on the USF-I J7 website. Revisions are summarized below and highlighted throughout the text. 1. Normal Ops/Prep Phase: The Base or a portion of the base is operating at normal capacity and Operations and Maintenance (O&M) service levels. Preparation and planning for consolidation and transition is underway. BOS-I and property inventory (real property), Foreign Excess Personal Property (FEPP), Contractor Managed Government Owned (CMGO), etc., should be conducted as early as possible and as needed. Contract identification and initial reviews during this phase are crucial to the successful transition of contractors. Begin identification of all environmental issues through the site transition survey process and begin coordination for site cleanup. 2. Thinning and Consolidating Phase: Transfer of personnel, equipment and functions in preparation for site transition. Life Support Areas (LSAs) consolidate to at least 80% of maximum capacity, and unnecessary LSA space is descoped from O&M contracts. Units consolidate to designated areas to reduce operational footprint. Reduction of contracts occurs. Base perimeter usually remains the same in this phase. 3. Mission Critical Ops Phase: The only remaining operational activities essential to the mission, base/complex infrastructure operations, or those which provide theater-wide support that cannot easily be relocated. Non-essential property thinned or consolidated elsewhere and Base Life Support (BLS) is limited to support minimal mission critical footprints. Perimeter security operations are ongoing and the camp is prepared for transition in 45 days or less. 4. Mothballed Phase: There is no intent to reactivate facilities or BLS (basic life support) functions for use by USF. All BLS and property thinned through approved processes, and O&M is limited to what is required to maintain internal security and perform periodic general maintenance inspections on critical infrastructure. The site is prepared for transition in 45 days or less. 5. CHANGE: Transition Phase: Bases will shift to a 45 day transition posture during descoping. Personnel and services will be reduced to facilitate final transition. Commanders will balance mission requirements with retrograde and base transition timelines. The Base enters an expeditionary stance 30 days before scheduled closure/return. Only essential personnel remain on site. All remaining contracts reduced to a minimum and are ready for termination within the final 45 days. This phase ends with base transition to GoI through the Receivership Secretariat. A guideline for prescribed conditions in the last 45 days is provided in Appendix 6 to Annex C, of USF-I OPORD 11-01, Change 1, May 11. Note: Not all phases are applicable depending on base transition plan. This is a guide for planning purposes only.